Raw Food For Real People is a raw food recipe book created by Chef Rod Rotundi, founder of Leaf Organics restaurants in Los Angeles. 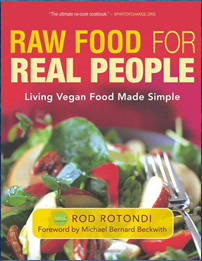 In this book Rotundi aims to demonstrate that preparing raw foods doesn’t have to be hard and a raw food diet can be a fun and delicious way to eat. Rotundi starts by explaining the benefits of a raw food diet highlighting the health-promoting effects of the enzymes, probiotics, alkaline minerals, antioxidants, and electromagnetic energy that is found in raw foods. He then outlines the basics involved in making your own raw foods at home including how to set up a raw kitchen, how to sprout and dehydration techniques. He also offers tips for transitioning to a raw food diet. Following this are recipes for breakfast, appetizers, salads, soups, entrees and desserts. Some of the recipes included in the book are Groovy Granola, Nori Rolls with Atlantis Paté, Mexican Corn Chowder, Rawsagna, Pad Thai, Mediterranean Burgers with Pesto Sauce, Really Raw Apple Pie and Chocolate Brownie Sundae. A section is included on the subject of “Making A Salad A Meal”, where Rotundi explains how to start with a simple salad of greens, adding components such as sprouted seeds, nuts and dips or patés. This makes your salads more nutritious so they can be a complete meal, rather than just a side dish. At the end of the book is a chapter devoted to raising kids on a raw food diet, which is based on the author’s personal experience with his daughter. Raw fruit and vegetables, avocado, sprouted chickpeas, buckwheat, oat groats, sprouted wild rice, seaweed, almond butter, tahini, walnuts, cashews, olives, coconut, raisins, dates, agave nectar, miso, coconut oil, nutritional yeast, nama shoyu, carob powder, cacao powder. Raw Food For Real People: Living Vegan Food Made Simple by the Chef and Founder of Leaf Organics retails at $24.95. Click Here to purchase this raw food recipe book at a discounted price. Provides a varied selection of raw food recipes. Includes detailed guidelines and charts for sprouting. Written by a successful raw food chef. Advance preparation is required for many of the recipes. A food dehydrator is required for some of the recipes. Some of the recipes, especially desserts, are high in fat and calories. A raw vegan diet may be nutritionally deficient for children. Raw Food For Real People offers a selection of recipes for ethnic dishes and American favorites from a successful raw food chef and restaurant owner. The recipes are likely to appeal to a wide audience, however many of them involve techniques like sprouting and dehydration, which will require preparation in advance. This book will be of interest to readers who want to learn more about the techniques involved in raw food cuisine and expand their repertoire of raw food recipes.